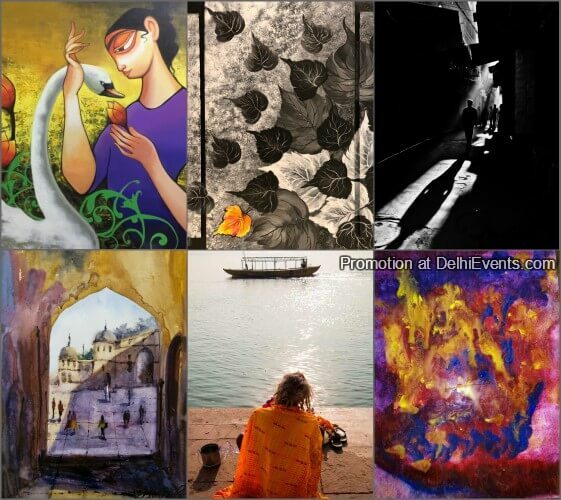 Event Description : EXHIBITION "Art All Around" a group show of establish & upcoming artists. Swati Salvi, Swati Chaudhary ,Gauri Bharadwaj, Mamta Rana, Poonam Bhatnagar, Pooja Kulkarni, Pranav Kulkarni, Poonam Saini, Satvik Sharma, Redon SK, Shivani Ratra & Ansh Batra connected by a shared interest of vivid imaginative nature involving the visual fusion of fantasy and reality. When you look at a painting or poster you’ve chosen to hang on your living room wall, you feel happy. The sculpture or figurines on the kitchen windowsill create a sense of joy. These varieties of art forms that we are surrounded by all come together to create the atmosphere that we want to live in. Art, in any form, can give people emotions that can lift up their spirit and make them more driven than ever. One of the most common trends in the tourism industry is hospitality art, which utilizes art to invite guests and engage them more throughout their stay. Corporate art inspires workers and boosts productivity using art inside the workplace. Hospital art, or healing art is also one way of helping patients recover faster and their family and healthcare workers to regain their composure and stay calm. Hence Art All Around under patronage of Ms Jyoti Kalra, owner Uchaan Art Gallery, The exhibition is carefully curated by Ms Swagatika Mohanty.